Tomorrow, on January 6th, visitors and residents of Playa del Carmen are invited to gather on 5th Avenue to watch the assembly of the largest "Rosca de Reyes" ever made on the Riviera Maya. 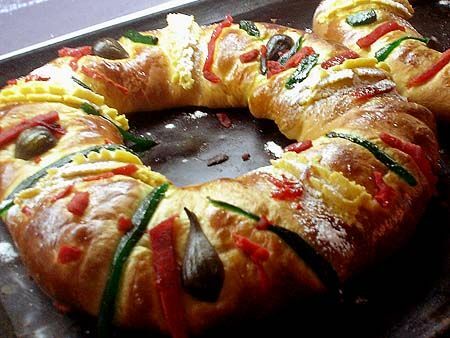 The "Rosca de Reyes", also known as "Twelfth Night Bread" and "Roscon de Reyes", is historically served on the evening of January 5, before the "Dia de Reyes". The origin of "roscón" appears related to the ancient Roman holiday, Saturnalia. This was a celebration dedicated to the god Saturn in order that the Roman people in general could celebrate the longer days that began to come after the winter solstice. Traditionally for this celebration, simple unleavened bread was prepared with figs, dates and honey and distributed amongst the commoners and slaves. 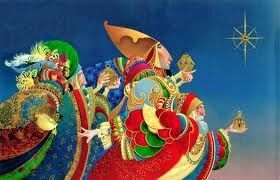 Early Christians took a little of this tradition and history blended with the visit of the Magi to celebrate the Epiphany. In Christianity, the circular shape of the bread symbolizes the eternal love of God, without beginning or end. The candied bits of fruit are the distractions of the world that prevent us from finding Jesus. Today's "Rosca de Reyes" is an oval, doughnut-like cake sweetened with honey and decorating with fruits of the desert, like figs, dates and nuts. Some consider the round cake an edible representation of the Advent wreath. In Mexico, the representation of the Nativity is incorporated into the "Rosca de Reyes", where the bread is embedded with one or more small dolls. These dolls represent the baby Jesus being hidden from King Herod's campaign to kill all the newborn babies who could be the prophesied messiah. Whoever finds the figurine in their slice of cake is charged with throwing a party on February 2, for the celebration of Candlemas (Día de la Candelaria). In the Mexican culture, this person will provide tamales and atole to their guests. Originally, these dolls were made ​​of porcelain or ceramic but today they are formed from a food-safe heat resistant plastic. The number of dolls in the bread varies according to the size of the cake from but "roscas" can be ordered to contain a certain amount and even none at all, although that's not very much fun. 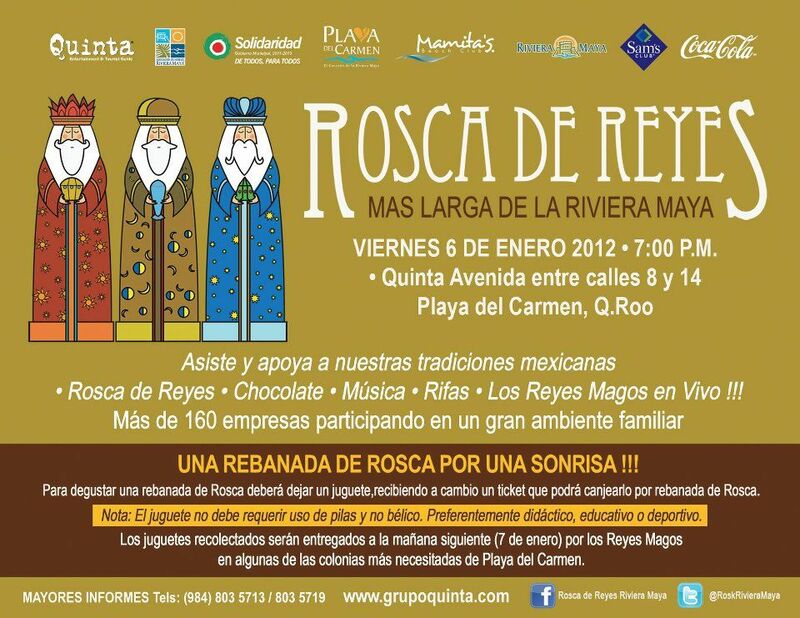 I hope you will join us all tomorrow at 7pm on 5th Avenue in Playa del Carmen to see the Riviera Maya's largest "Rosca de Reyes". The cake will be assembled and displayed between calles 8 and 14. Over 160 local businesses and organizations have participated in this exciting family event! There may even be a visit from the Three Kings! If you would like to try a slice, bring a new unwrapped toy as a donation. The toys will be gathered and distributed to underprivileged children in the poorest colonias in the region so that they too may enjoy a gift from the Three Kings.